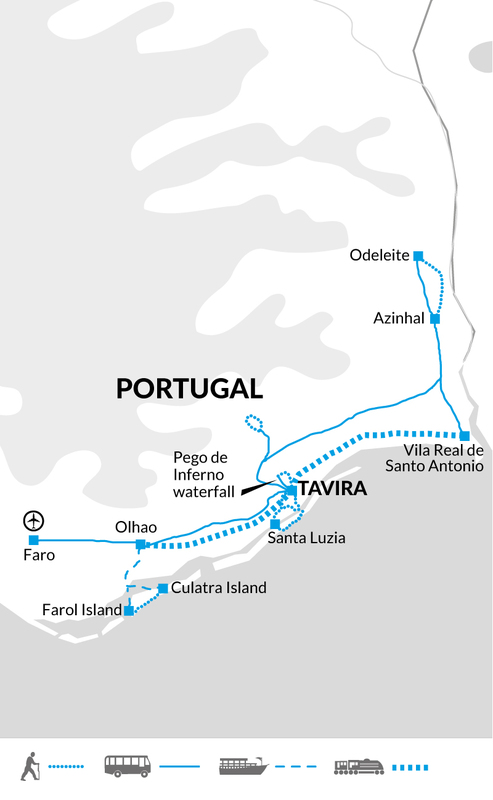 Based in the historic town of Tavira, this walking trip combines scenic coastal and inland walking. The relaxed walks take you through picturesque villages and traditional fishing communities, past orchards, into the rolling Barrocal Hills and along unspoilt sandbank islands. Our trip starts in the delightful town of Tavira, about forty minutes from Faro Airport. If you arrive early our hotel is the prefect base from which to explore the cobbled streets on foot discovering the pretty tiled houses and there are plentiful alfresco dining options. Our welcoming hotel is within walking distance of the old centre, restaurants and bars. Its location offers great views over the town and river from the rooftop bar and outside pool area. Today we explore the Tavira coast, walking through the old town out to the pier to take a 10 minute boat journey across to Tavira island. Tavira island forms part of Rio Formosa Estuarine National Park, a long strip of salt marshes and lagoons stretching from Faro to the Spanish Border. We walk along the unspoiled beaches, observing the wetland ecosystem and coastal habitats, past; mudflats, sea rushes and the native curry plant (with yellow flowers that smells like curry powder!) The area is a paradise for birdwatches and we'll see flamingos feeding in the shallow water. Our walk continues along the beautiful Praia dos Barrills, a long white sandy beach backed by sand dunes. The most noticeable and unique feature of this beach is the anchor 'graveyard'. Dozens of anchors have been planted in the dunes, an eerie reminder of the regions once thriving tuna fishing industry. The fishermen huts have now been converted into cafes, restaurants and shops. From Terra Estreita Beach we take boat back to the mainland, to the small fishing village of Santa Luzia from where we walk back to town. There will be time this afternoon time to explore more of Tavira. Take in the view up river from the seven-arched Roman Bridge, although actually Moorish in its origin, throughout the centuries the bridge has provided vital access across the River Gilao. Today's 15 kilometre walk is expected to take approximately four hours with a total ascent and descent of 70 metres. Today we drive (30 min) to the small village of Azinhal. We walk through gentle hills and low rising vegetation along the banks of Guadiana river (which marks the Spanish border) and on to the small old fashioned village of Odeleite. From Odeleite we drive south to San Antonio de Vila Real. We take some time here for a coffee overlooking the main square and stroll around the pedestrianized streets leading to the river, before travelling back to Tavira by train. Today's 13 kilometre walk is expected to take approximately four-and-a-half hours with a total ascent of 170 metres and descent of 205 metres. Day 4 - Walk from Pego de Inferno waterfall to Tavira. This morning we walk from Tavira following the River Sequa to through bamboo trees and lemon orchards with views across the Asseca Valley, to reach Pego de Inferno waterfall. There is time to rest and take a swim in the lagoon before heading back to Tavira by taxis. Today's 11 kilometre walk is expected to take approximately three-and-a-half hours with a total ascent and descent of 230 metres. Day 5 - Free day. Opportunity to relax or walk the Via Algarviana trail. Today is a free day to relax on the local beaches or explore the region more. It is possible to take an inland walk following the Via Algarviana long distance walking trail through the Barrocal hills. Part of the Great Pedestrian Route (GR13) which traverses the Algarve from East to West this trail flows an old pilgrim path though small rural villages. The walk options can be discussed with your Leader. For an interesting insight into Portuguese traditions you could attend a Fado performance, this 30 minute show starts with a film about the history of Fado, a Portuguese traditional song, followed by guitarists and a singer performing a range of Fado songs. The tour leader will be able to advice on the best location and timings. You could also visit the Camera Obscura, housed in an old water tower close to the castle. A rotating mirror on the roof of the tower projects a telescopic view of Tavira, the guide uses the image to point out key sights and explain the history and culture of the town. Today's optional 14 kilometre walk is expected to take approximately four hours with a total ascent and descent of 450 metres. Day 6 - Walk in the Barrocal hills north of Tavira. Today we travel by taxis from Tavira to the Barrocal hills north west of Tavira. The Barrocal area is the Algarve's fertile farmland situated between the coastal strip and the mountains of the Serra. We'll follow a dirt track through cork oak woodland, olive groves and citrus orchards. In the springtime wildflowers cover the fields and in autumn the area becomes a haven for birds. Today we will enjoy a picnic lunch, getting supplies in Tavira before leaving. Tonight you could try a Cataplana, originating from southern Portugal this flavoursome dish combines a variety of seafood in an aromatic stew, cooked in a copper clam shaped pot. Today's 12 kilometre walk is expected to take approximately three-and-a-half hours with a total ascent and descent of 350 metres. This morning we take the train to Olhao. Olhao is the Algarve's largest fishing port; we'll visit the morning fish and vegetable market before taking the small local ferry to Culatra island (30 minutes). The sand bar island of Culatra in Ria Formosa National Park is home to a small fishing community living in a cluster of low built houses and cottages. With no cars or paved roads walking around the sparsely developed island feels like stepping back in time, we'll take the wooden walkway through the sand dune system and relax on the vast empty beaches. Culatra is known for its abundant wildlife, and is a prime spot for birdwatching with a variety of seabird species. We get the boat back to the mainland from the other side of the island at Ilha do Farol (lighthouse), and travel back to our hotel. 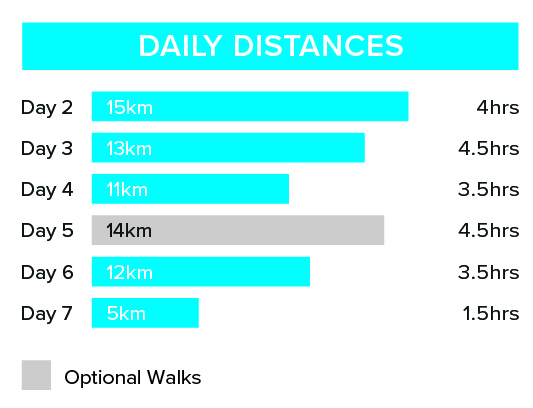 Today's five kilometre walk is expected to take approximately one-and-a-half hours along a flat route. Day 8 - Trip ends in Tavira. Your trip ends this morning after breakfast, in Tavira. One main piece of baggage and daypack a 20-30 litre day sack is recommended. You will need to carry what you need for the day which may include a jumper, camera, sun-cream, picnic lunch etc. On hot days you will carry fewer clothes but more drinking water. Local Crew: Although entirely voluntary, tipping is a recognized part of life in this region of the world. Some local staff will look to members of the group for personal recognition of particular services provided. In order to make things easier for you, the Tour Leaders may organise a group's tips kitty and if this is the case, they will account for it throughout the tour. Accordingly, we recommend approximately 15€ per person for tipping. 10% is recommended at meal times. Our hotel is located in a quite hillside area of Tavira, a five minute walk from the centre. The Maria Nova Lounge offers great views over the city, both from your own private balcony and the rooftop bar. The hotel features both an indoor and outdoor swimming pool, perfect for relaxing after a day of walking. A plentiful buffet breakfast will be served daily from the on-site restaurant. Walks on 5 days for between 1.5 to 4.5 hours each day on well-maintained trails and sandy beaches. Looking to spend longer exploring Portugal? To see more of the Algarve you can combine our Walking in the Eastern Algarve with our Remote Coastal Trails of Portugal for a two week Portuguese walking holiday. Many of our dates work back to back, both holidays are centre based and they begin and end at Faro Airport, making extending your time easy! Speak to one of our Adventure Travel Consultants to help you arrange this. Portugal has so much potential for fantastic walking trips. This trip explores a different, less vitiated area of the Algarve. Suitable for all the trip is graded as easy, with relaxed walking and day trips from our base in the historic beautiful town of Tavira, combining scenic coastal and inland countryside walks.